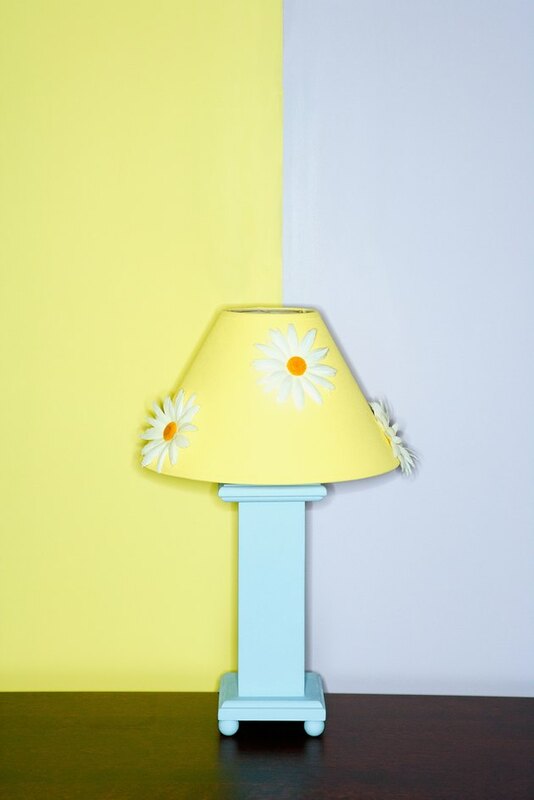 Give new life to an old lampshade with a coat of paint. Transform a plain white paper shade with shimmering iridescent watercolor craft paints. The paints come in small jars in a myriad of bright colors. Wet the cake in the jar, and brush paint thickly on the shade. The paint will dry a paler hue than when wet and be slightly uneven in coverage, creating a handcrafted look. This works well on small strings of paper lanterns and larger bamboo and paper pendants, as well. Over time, the color may fade, and you can re-paint it or add a design for a whole new look. Quick and easy color goes right on from a can. Spray paint an old lamp shade for a nice, opaque, modern finish. You can use whatever is gathering dust on the shelf in the garage, or buy the lampshade colors of your dreams to really customize the shade. Plan on two coats for solid coverage. Once the first coat is dry, put the lamp on its base, and turn on the light bulb. Look for spots where the light shines through so you can be sure to cover them well with the second coat. Lamps are elegant with a matte finish, but use high gloss in a bright color or shiny black on a show-off, dramatic drum shade. Fabric paint is made for cloth and will stand up to some abuse from dusters as well as heat from a very hot bulb. The paint is sold at art supply and craft stores in small jars and can be layered on thickly or thinly to suit your style. For best results, paint over a solid color fabric shade and choose a darker paint color. A painted-over pattern might show through the new paint and necessitate several coats – more time-consuming than efficient for a quick DIY project. Fabric paint bonds with the fabric and should not crack or flake on the lampshade. Edging a newly painted lampshade with an adhesive cloth tape band gives it a crisp, finished look. Break out the hobby paint, and turn an old shade into the accessory du jour. Hobby paints are inexpensive and come in a rainbow of colors as well as metallic finishes, translucent shades and pastels. Use them on smaller shades with a flat brush, and test for light areas once the first coat dries. Another hobby paint that will produce a rich faux finish on a metal lamp shade is verdigris. Create faux verdigris with a multi-part painting process using acrylic paints, or just get a kit. Faux verdigris kits contain a two-part formula that involves painting copper paint over the shade and then painting a reactive liquid over that to color the copper with an aged turquoise-green patina. What Glaze Will Tone Down Bright Paint Colors?